'I will join the armed forces like my father,' says Arna Kumar, 6, whose father CRPF Commandant Pramod Kumar was killed by terrorists last Independence Day. IMAGE: Neha Kumar hoists the national flag. She says she is proud of her husband Pramod Kumar who laid down his life for the nation. 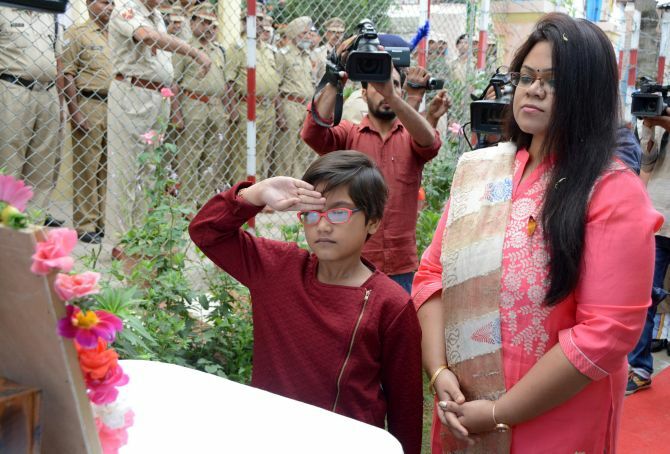 The wife and six-year-old daughter of slain Central Reserve Police Force Commandant Pramod Kumar unfurled the tricolour at the CRPF battalion camp in Srinagar where exactly a year ago he saluted the national flag and was killed minutes later in an encounter with terrorists. Pramod Kumar was awarded the Kirti Chakra, the nation's third highest honour for gallantry in peacetime this Independence Day. 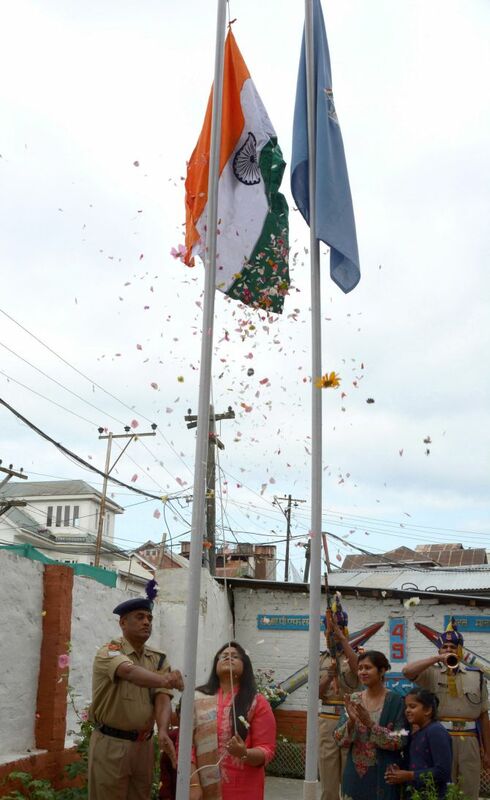 To honour their fallen comrade, the CRPF invited Neha Kumar and Arna Kumar, the late CRPF commandant's wife and daughter from their home in Jharkhand, to hoist the tricolour at the 49th Battalion headquarters at Karan Nagar in Srinagar. After unfurling the flag, an emotional Neha, who wants to join the CRPF, said it was a tough decision for her to come to Srinagar where her husband was killed. "It is my first visit to Kashmir," she said. "Somehow, I decided to come and celebrate Independence Day with the jawans and officers." IMAGE: Neha and Arna Kumar present sweets to jawans after unfurling the flag at the 49th Battalion headquarters at Karan Nagar in Srinagar. "His sacrifice has been recognised which is a great thing for me. 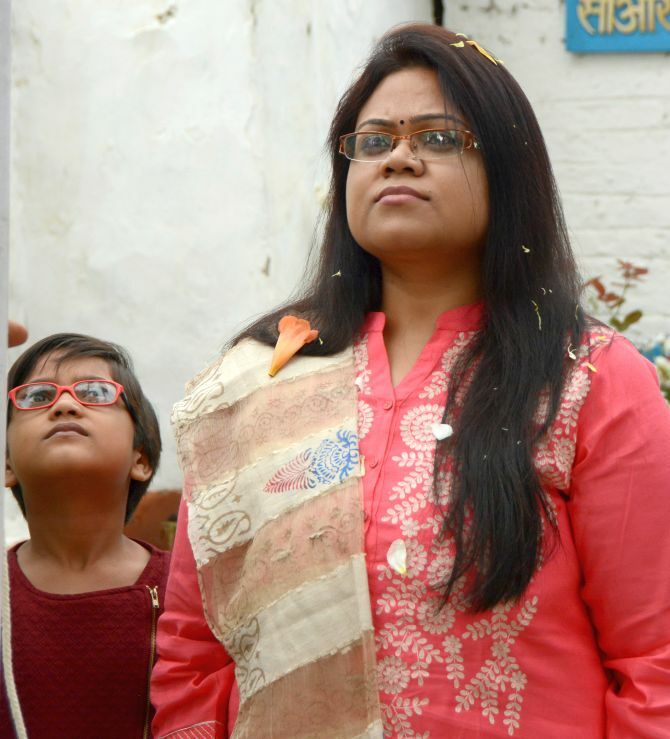 Announcing the Kirti Chakra for my late husband has added to my pride," she said. "I miss my dad a lot," Arna said. "When his absence pains me beyond limits, I go to the room where we have kept his portrait and sit in front of it." "I will join the armed forces, just like my father," the child added. 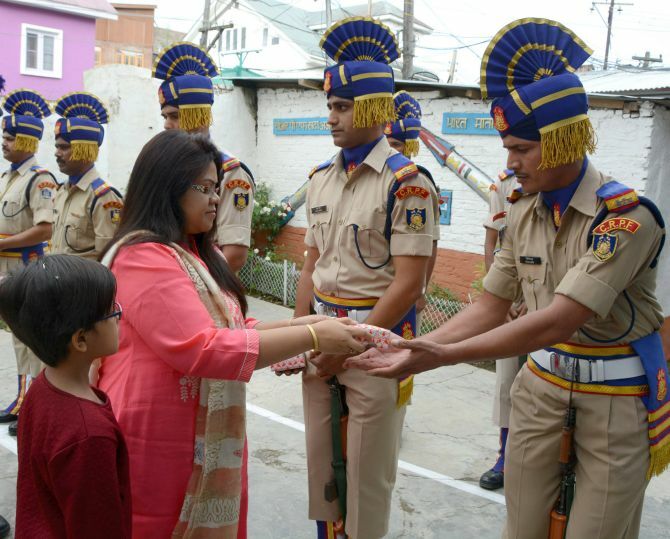 IMAGE: Neha and Arna Kumar pay homage to Pramod Kumar who was posthumously awarded the Kirti Chakra for his heroism. Recalling the day Pramod was killed, Neha said when she phoned her husband several times and there was no response she "became apprehensive but thought he was busy in the flag hoisting ceremony." "When I wasn't able to get through to Pramod I called up the control room. A jawan handed over the phone to another who kept crying and was unable to say a word to me. Then, the other jawan told me, 'Sahab ko goli lagi hai (Sir has been hit by a bullet)'." When Neha discovered that her husband had been shot in the head she feared the worst. IMAGE: Both Neha and Arna want to serve in the armed forces. At 11.30 am, August 15, 2016, the phone rang. "The officer asked me to give the phone to someone else. I know when they ask for another person, it's to give bad news," she said, adding that she called her brother-in-law to take the call. Pramod Kumar had made the ultimate sacrifice for the motherland. He had been posted to Srinagar in April 2014 and was promoted as a commandant on July 12, 2016. A native of Patna in Bihar, a resident of Jamtara in Jharkhand, the officer had been thrice decorated with the CRPF director general's commendation in 2011, 2014 and 2015. He had served in the Special Protection Group for three years. Last August 15, Pramod Kumar hoisted the flag between 8:30 am and 8:40 am and in his speech remarked that with India clocking 70 years of its freedom, the responsibility on the security forces had increased and they would have to effectively tackle terrorists and incidents of stone pelting in the Kashmir valley. Just before he ended his speech, Kumar, in a recorded video of the event, is seen looking at his watch and heard saying, 'It is an important day,' unaware of the fate that awaited him. Minutes later, he was killed at Nowhatta Chowk fighting terrorists. Realling the events of last year's Independence Day, a CRPF officer said, the wireless set in the CRPF control room crackled informing the paramilitary force that terrorists had hurled grenades and fired at four sites in Srinagar -- Nowhatta Chowk, Gojwara Chowk, Bata Gali and Khaniyar Chowk. Kumar, along with a small team, dashed out in a bullet-proof vehicle. "The terrorists were still firing. Kumar led from the front, but was shot grievously," the CRPF officer said. He was rushed to the army's 92 base hospital in Srinagar where he succumbed. Kumar and his team killed two foreign terrorists before he was shot in the head.